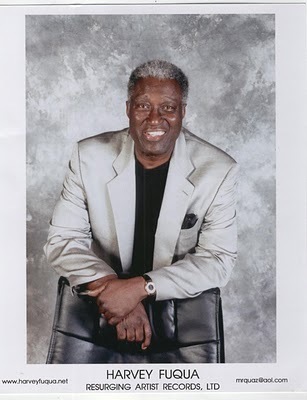 Born in Louisville, Kentucky, USA, in July 1929, Harvey Fuqua who has died aged 80, enjoyed considerable R&B and pop chart success with his group The Moonglows in the mid- to late-1950s, with popular hits for the Chess label that included "Sincerely", "See Saw" and "Ten Commandments of Love". Harvey and The Moonglows also can be heard singing back-up vocals on classic Chess hits including Bo Diddley's "Diddley Daddy" and "Diddy Wah Diddy" and Chuck Berry's "Almost Grown" and "Back In The USA". The Moonglows were inducted into the Rock & Roll Hall of Fame in 2000. After leaving The Moonglows in the late 1950s, Harvey became a key figure in the development of Motown Records, working with legends including Johnny Bristol, Marvin Gaye, Smokey Robinson, The Spinners and Jr. Walker & The All-Stars, co-writing and producing hits such as "That's What Girls Are Made For" (The Spinners, 1961), "If I Could Build My Whole World Around You" (Marvin Gaye & Tammi Terrell, 1967), "My Whole World Ended (The Moment You Left Me)" (David Ruffin, 1969) and "Someday We'll Be Together" (Diana Ross & The Supremes, 1969). He enjoyed further chart success in the 1970s and 1980s, working with disco/funk acts including New Birth, Sylvester and Two Tons O' Fun/The Weather Girls. At Chess Records not only was he the lead singer of the Moonglows, he also is the person responsible for bringing Etta James to Chess (despite what you may have seen on the silver screen in Cadillac Records.) He was a great songwriter and producer, responsible for bringing both Marvin Gaye and Tammi Terrell to Motown, as well as Jr. Walker, Shorty Long and the Spinners. Pre-Motown, he was a record executive with his own label, Tri-Phi. Post-Motown, he gave us New Birth, Weather Girls and Sylvester. That is pretty much what you would be able to piece together. What you could never piece together is the impact that he had over American Popular Music. If I had to make an analogy, Harvey Fuqua was like Pete Rose or Magic Johnson. He could play any role that you wanted him to, onstage or offstage. He was a great singer, but he also put together & managed a tour. He wrote hit songs, but he also managed record companies. For the past 10 years or so, I have had a chance to be around Harvey Fuqua quite a bit and to observe how some of the most important historical figures in the history of American Popular music behaved when they were around Harvey. He gave me the chance to be "the fly on his wall." Here are two examples. --MARY WILSON OF THE SUPREMES: While I was in the middle of interviewing Mary, Harvey walks in the room and Mary says; "that's who you need to be interviewing, not me, he's the guy who knows it all and did it all." --PAUL SIMON OF SIMON & GARFUNKEL: I was standing next to Paul Simon, while the Moonglows were rehearsing at the Rock n' Roll Hall of Fame Inductions. Paul Simon was completely oblivious to the fact that I was standing next to him. He was so mesmerized by the strength of the Moonglows performance that he started talking to himself and said; "this is what rock n' roll sounded like when it first started." --MICKEY MCGILL OF THE DELLS: "Harvey is the one who taught the Dells how to sing." Whenever he would enter a room everyone would stop doing whatever they were doing and say, "there's Harvey." He was a big guy, physically imposing, who when he spoke, sounded like the "voice of God." You might not know who important he is, but take it from me, everything that we think that we know about American Popular Music, would be different, if not for Harvey Fuqua. Despite being placed on such a lofty pedestal by his peers, Harvey always impressed me as being a very humble person. For example, Harvey was the victim of one of the most scandalous episodes in the history of American Popular Music, when he was forced to allow Disc Jockey Alan Freed's name to be recorded as "co-writer of the Moonglows song "Sincerely." In exchange for securing airplay on Freed's radio program. Allan Freed of course wasn't satisfied with gaining ½ of the royalties Moonglows hit song. He also had the song re-recorded by the McGuire Sisters and it became a hit all over again, creating more profits for Alan Freed. When I asked Harvey how he could allow something that he created to be stolen in this fashion, his response was: "all I cared about in those days was hearing my song on the radio and if that is what I had to do in order to be on the radio, then so be it." What Harvey didn't say (cuz he didn't have to) was that what Alan Freed did is quite literally the definition of something called PAYOLA, for which Alan Freed ultimately served jail time for. So in reality Harvey actually got the last laugh on Alan Freed. Back in the early 2000's, I was able to cover the RRHOF induction ceremonies for the first time because of Harvey Fuqua. While I was in the press room, a woman from VH-1 was walking around the room, basically looking for people to kick out. She checked my credentials and once she was convinced that I was legit, she then questioned me about the "legitimacy" of all of the other Black people in the room, looking to kick them out if need be. She pointed to each one and asked me to identify them. When she pointed to Harvey, I told her who she was and she replied; "oh I thought that he was a janitor." A few weeks later when I wrote about this incident, Harvey told me; "never stop writing about stuff like that, till it stops happening...." In fact it was Harvey who told me; "Make sure that you continue to write about more than just R&B music or else they will try to marginalize you and keep you in the ghetto..."
I could write a whole lot more about Harvey Fuqua, and I may do it in the future at some point, but I am not going to do it right now. Harvey Fuqua was a good friend to both me and to Soul-Patrol during the years when we were just getting off of the ground. He opened many doors to me that would have otherwise been closed. He cared very much about the idea of the website and helped me as much as he could in taking that idea and making it into a reality. Harvey identified, saw potential in and mentored Marvin Gaye. He did the same thing for me. He did it for anyone that he thought was deserving! IMHO, a big part of what is wrong with America today, is that we don't have as many men in this country anymore who are like this as we used to.